New York's coolest fashion BFFs finally team up for a never-seen-before collaboration. A fresh take on designer collars the Marc Jacobs x Anna Sui collection will prominently feature iconic illustrations by Lipstick artist Will Broome, who has created new characters for the project. From Miss and Mister Marc cartoons (playfully portraying Sui and Jacobs), to Jacobs's dog Neville, the collection of bags, shoes, and accessories is the perfect representation of the duo's friendship – fun, candid, and colourful. With her fun and unique illustration style and colour Anjelcia has gained recognition of her talent from fashion icons such as Pat McGrath, Marc Jacobs, Moschino, Jeremy Scott, Anna Sui, Adam Selman, Marco de Vincenzo, and Ohne Titel. Anjelica was named one of "Instagram's Best Fashion Illustrators" by Radisson Red and Skinny Dip London's "Young British Talent". ELLE Magazine Greece recognised Anjelica Roselyn as one of their Favourite Fashion Illustrators. ELLE.gr writes: "This talented girl from England can combine bold colors with feminist references. She describes her style as "free, funny and colorful". We would add "strangely intimate with a precious sense of street style atmosphere"". "Loved working on this as it's something a little different. The brand themselves came up with the idea of an 'X-Ray' illustration of their stylish bags to show just how practical all the different compartments are-seriously, there's something for everything! A commuter/working Mum's dream!" Fact + Fiction started life as revolutionary gym bag brand GymTote, founded in 2012 by gym junkie Helena Searcaigh and handbag designer and mum of two Nicola Kearney. After years of carrying an ugly gym bag around, and once pulling out a sweaty sports bra in a meeting, Helena decided that there must be a better way to carry her kit to andfrom work. When Helena met Nicola, the brand was born. Capturing the spirit of the small, specialist shops of yesteryear, where a warm welcome and honest work ethic were the order of the day, Jones and Co. is a family-run studio based at our home in Cape Town, South Africa. Here, everyone plays a part – Dylan (that’s me) illustrates, my wife, Heike, takes care of production, and our kids, Anna-Rose and Sophie-Mae, provide my inspiration as they relish the simple joys of childhood. It’s in this environment, between the ebb and flow of everyday family life that I create and craft my passion – character design, editorial and all forms of vector illustration. Mie created Illustrations for a campaign about the IT educations at the Faculty and Science at the University of Copenhagen. The Campaign is showcased on train stations around Denmark. Pulling on the same colour palettes, humours designs and contemporary styles as the adult collections, Little Marc Jacobs’ collections are ﬁlled to the brim with some of the best in children’s fashion. Between wardrobe collections ranging from everyday, casual styles for boys, girls and baby, Little Marc Jacob’s collections are always topped off with some of the best kid’s fashion accessories around. Will Broome has an ongoing collaboration with the label , these are examples are the latest form the Summer collection . An exciting collaboration between award winning illustrator Emma Cowlam and graphic designer Lisa Kew, Just Add Stamp is proud to introduce a range of greetings cards, notecards and notebooks designed to embrace the tradition of hand-written correspondence. Just Add Stamp encourages news sharing in a personal and thoughtful way, rather than the digital default of modern life. The designs are sophisticated, stylish, elegant and aspirational – Emma’s drawings are inspired by traditional fashion illustrations and given a contemporary, realistic twist. Rosie McGuinness for Jaeger Press Show. Commissioned by Jaeger for the their Press Show for the new SS18 collection. 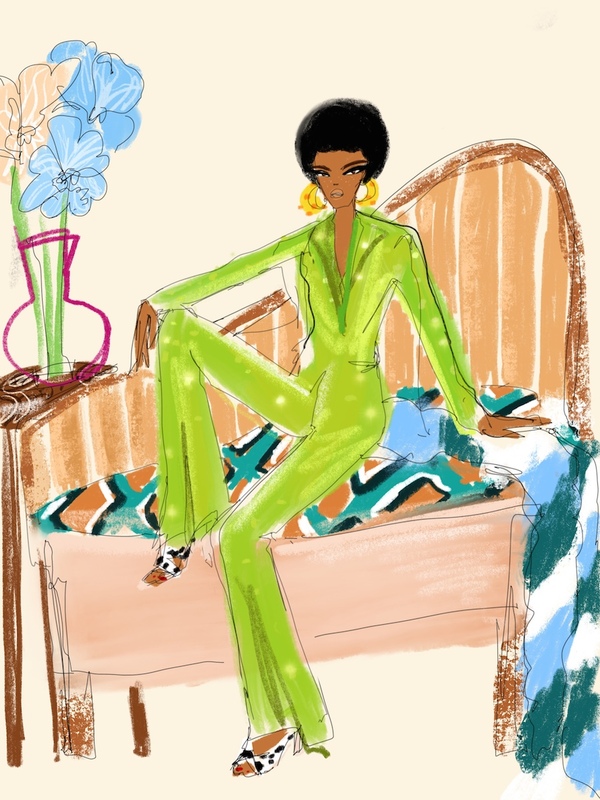 Pioneering style since 1884, Jaeger asked Rosie McGuinness to create 9 bespoke images illustrated directly from both the Menswear and Womenswear collections. Displayed on large screens amongst the clothes , with lucky members of the fashion press receiving a limited edition print of her work to take home.